1999-2007 Upgrades and Aftermarket - General Upgrading or adding OEM or aftermarket equipment to your 1999-2007 Super Duty. Please confine discussion of topics in this forum to those items that are not engine-specific. Diesel Forum - TheDieselStop.com > 1999-2007 Ford Super Duties > 1999-2007 Upgrades and Aftermarket - General > My new LED headlight bulbs are flickering...why? My new LED headlight bulbs are flickering...why? I finally got sick and tired of the crummy headlights on my 05' F250 and decided to upgrade the bulbs to some LED's. I did some research, and found some on Amazon that had great reviews, and looked pretty good. I think they were around $70...so not cheap. I put them in tonight, turned them on...and WOW, they were awesome! They put out so much more light, it was great! So then I fired up the truck and took it for a drive....so much better than before! But then I get home, and after I turned the lights off, I left the truck idling (was hooking up a trailer to move it around)....and I noticed that when the lights were turned OFF....I could see them blinking/flickering a little bit. I turned them back on....and I noticed that even when they were on, they were flickering just slightly. I turned them on and off a couple of times, and sometimes I could get them to turn on and not flicker...and other times they would. Even wit the truck not running, sometimes both flickers when the lights are on, sometimes just one flickers. Very random. Did I just get a bad set of LED lights? I saw some "anti-flicker" harshness on amazon....would those fix the problem? Or should I just returns them? Any help would be great! Thanks!!!! IIRC, in the newer trucks, the headlamp switch doesn't actually do the headlight switching. The power to the headlamps is controlled by a module (GEM), and your headlight switch only tells the module to turn the headlamps on or off. The flicker is due to the SSR (solid state relay) in the module leaking a bit of current when OFF, and not having sufficient load on them (current passing through it) when ON. The LED lamps put very little [electrical] burden on the system, and will light at very low current levels, thus the OFF flicker. To test this, unplug the headlamp connector (at the lamp) and measure for DC voltage. One remedy is to put a resistor in parallel with the lamp. This puts additional load on the SSR. However the downside is the resistors can get HOT! The big advantage of LED's is they draw less current than incandescent/halogen lamps, but adding resistive load to the circuit, you increase the current draw, which defeats the purpose (at least part) of having the LED's in the first place. Lastly, did you check to see if your Hi-beams worked? I tried several different iterations of LED headlamps, in both my truck and my CrownVic Interceptor, and found none really gave good high-beam/low-beam performance. They were bright at low beam, but high was just barely any higher/brighter. I never had a flicker issue as both have old-school headlamp switches! Last edited by Calico5; 11-07-2018 at 08:32 PM. Yes, it appeared that the hi-beams worked. You could definitely tell that the angle of the high would rise (like when you put your high beams on), and I coud see farther out in front of the truck......but the light output almost seamed the same, or maybe even less then just using the regular beams. Am I better off to just put in a set of brighter Halogen bulbs? 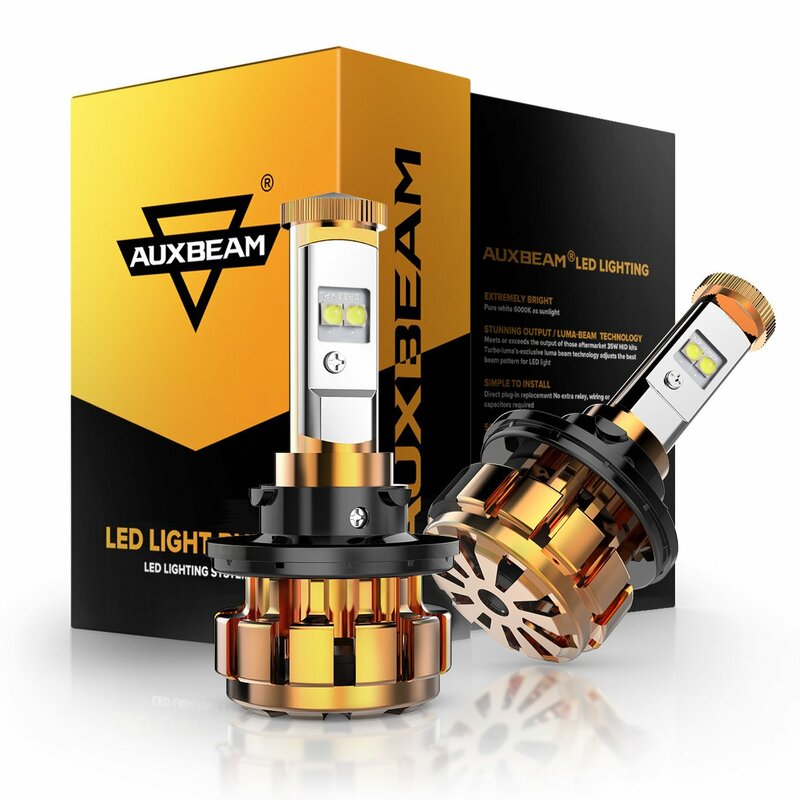 Instead of rolling the dice on another set of LED headlight bulbs that may, or may not work correctly.......what about a brighter set of Halogen bulbs? Something like these Sylvania XZE bulbs? Would they be close to the same light output as the LED bulbs? Or are LED's much brighter? Yes, it appeared that the hi-beams worked. ......but the light output almost seamed the same, or maybe even less then just using the regular beams. Yep... I also had the same problem. The light beam seemed to get higher, but the light intensity decreased. Unfortunately, I don't think the quality and engineering is quite "there" yet with these retrofit LED bulbs. Kinda funny how no reputable companies (Phillips, Sylvania, etc.) are producing them. Only Chi-com crap. That's what I ended up doing. I think I've got the "Silverstar Ultra" bulbs. They're pretty good... a little pricey though. Last edited by Calico5; 11-08-2018 at 10:11 PM. I bought the Silverstar Ultra, but haven't installed them yet. Ford Remote Start; High idle mod; Timbren load levelers, Scangauge II, Blue Spring upgrade, Quick Start 200 amp large frame alternator, 2 batteries January 2010; GPCM replace October 2011; 2 EGR valves; EGR Cooler replaced 12/30/11; Performance Machine & Mfg. coolant filter added 1/2/12; Rotella T6 5W40 oil; turned rotors, replaced brake pads for 1st time 1/7/12 101K miles; GPCM, both subharnesses and all 8 glowplugs replaced 1/5/13 at 118,000 miles; 2 Ford batteries replaced under battery warranty twice, the latest 9/18/2015; FICM power supply board replaced with Dorman board 11/20/13. Coolant flushed and replaced with Prestone ELC 9/27/14. STC fitting 10/19/14; Dummy Plugs 11/8/14; Turbo rebuilt 11/29/14; cold side CAC tube and boots replaced with metal tube 1/24/15; replaced hot side boots 1/30/16. Well, I got the new Beamtech LED bulbs in yesterday. They work great!!! No flicker at all, they world like they are supposed to. I didn’t need any type of anti-flicker harness….just plugged them right into the oem bulb plug. They have a great pattern, are MUCH brighter than the standard halogen bulbs that were in there, and the high-beams work great! I’m very happy with them…..I would recommend them to anyone looking to upgrade the lighting on their Superdutys. It’s a night and day different compared to the bulbs that were in there. And they were only $38 a set off of Amazon. Can you post a link to what you bought? Just for clarity, the original poster's truck is a 2005. the headlamps are not fed power from a module circuit or FET. Even the auto lamps use simple relays in the VSM. Lighting systems using transistors to control lighting circuits in Super Duty's did not come into play until model year 2008.